Reigning UFC bantamweight champion T.J. Dillashaw will try to join Conor McGregor, Daniel Cormier, and Amanda Nunes as the only fighters in UFC history to simultaneously hold two titles, when he challenges current flyweight champion Henry Cejudo later this month at UFC on ESPN+ 1 in Brooklyn. While Dillashaw has dominated the competition at 135 pounds, including back-to-back title wins over rival Cody Garbrandt, “The Viper” has never competed at the flyweight level. 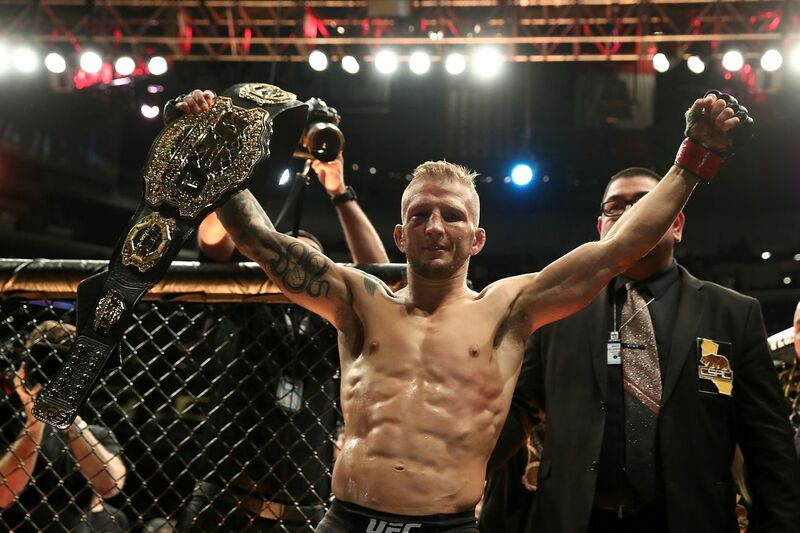 In order to leave UFC on ESPN+ 1 a two-division champion, Dillashaw must successfully cut weight, adapt to his new environment, and take out the man who just ended Demetrious Johnson’s historic flyweight title reign. Should Dillashaw accomplish that feat then the sky will truly be the limit. In fact, the UFC bantamweight king is already contemplating a potential move up to featherweight after his journey down to 125 pounds. “Would I move up to 145 [pounds]? Absolutely, man,” Dillashaw said during a recent Instagram live video. “I would love to. I’m a professional. I train hard. Making ’25s has been a process in its own… To get my body down there and do it the right way. ’45s would have to be the same thing, it would be a lot of work. Of course, a move up to featherweight for Dillashaw would equate to a potential clash with current champion Max Holloway, who is coming off a brutal TKO win over Brian Ortega and has won his last 13 fights in a row. Dillashaw understands that he’ll have to get past Cejudo first, but the idea of winning a third UFC title is too good to pass up. Dillashaw will try to set his plans in motion when he takes on Cejudo at UFC on ESPN+ 1 on Jan. 19 from inside Barclays Center in Brooklyn, New York. For more UFC Brooklyn fight card news click here. Khabib Nurmagomedov just beat the biggest star in mixed martial arts, and now, it appears as though he wants to be compensated accordingly. It remains to be seen if Anthony Smith ends up facing Jon Jones in the coming months, but “Lionheart” delivered a warning to the former, light-heavyweight champ, following his win last night at UFC Moncton. Smith took on fellow contender, Volkan Oezdemir in Saturday’s headliner, and proceeded to finish the feared striker with a rear-naked-choke in round three. Following round two, it looked like Oezdemir might be headed to victory, as he controlled much of the second frame. Smith, however, rebounded in round three, and scored the biggest win of his career. There you have it. Now, Jones’ comments shouldn’t come as that big of a surprise really. While Smith showed a ton of heart last night, and once again, demonstrated he’s a very dangerous fighter, he didn’t cruise through Oezdemir. It should also be noted that Jones didn’t come out and outright, criticize Smith’s performance either. Smith is on point in noting that Jones should worry about beating Gustafsson first, after all, their first fight in 2013 was very competitive, and “The Mauler” has remained a top contender for a reason. The two will rematch on December 29th at UFC 232, which will go down in Las Vegas, Nevada. The post UFC Moncton: Anthony Smith Delivers Warning to Jon Jones in Response to Former Champ appeared first on Caged Insider. Former champ Eddie Alvarez is a UFC fighter no more. After four years and eight fights in the Octagon, Alvarez entered free agency after his last fight (a TKO loss to Dustin Poirier), and has just signed with Asian promotion ONE Championship. If you’ll recall, Alvarez used to fight in Japan back in the day. He then jumped to Bellator and became a champ there before going to the UFC. ONE is considered the best Asian-based promotion out there, and they regularly hold events in countries the UFC has never been able to break into (like Indonesia, Singapore, Thailand – they even have an event scheduled for Myanmar (whose government would probably arrest and execute half the MMA media outright). It’s a safe bet that Alvarez is getting paid a healthy sum for this move. The post Former Champ Eddie Alvarez Leaves UFC for ONE Championships appeared first on Caged Insider.